The Grade 2, $200,000 Rachel Alexandra Stakes has produced the likes of recent Kentucky Oaks winners Monomoy Girl, Untapable and Summerly. Ten 3-year-old fillies were entered in this year’s event with aspirations of adding their name to that list. 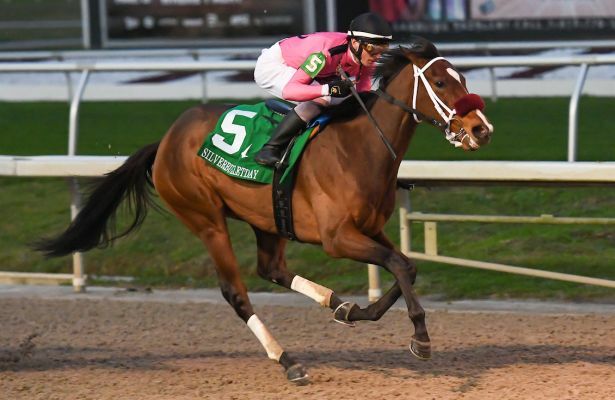 The 5-2 morning line favorite for the Rachel Alexandra is Summer Wind Equine’s Chasing Yesterday, a half-sister to American Pharoah, but the Daily Racing Form notes she will not ship from trainer Bob Baffert's Southern California base to New Orleans. The Starlet Stakes (G1) winner drew post 10 in the Rachel Alexandra. Michael Ryan’s Positive Spirit is a half-sister to 2017 Kentucky Derby winner Always Dreaming and will break from the four hole under jockey Manny Franco as the co-second choice. Last out, the daughter of Pioneerof the Nile was a stunning 10½ length winner of the Demoiselle Stakes (G2) at Aqueduct. She is trained by Rodolphe Brisset and sits at No. 7 on the Oaks Leaderboard. The Rachel Alexandra Stakes is named after the 2009 Horse of the Year and Hall of Fame inductee whose sensational 3-year-old campaign included victories against colts in the Preakness Stakes, Haskell Invitational and Woodward Stakes (all Grade I races). Originally owned by Dolphus Morrison and trained by Hal Wiggins, she was privately purchased by Jess Jackson’s Stonestreet Farm and moved to the barn of Steve Asmussen following her runaway victory in the Kentucky Oaks, which she won by 20¼ lengths. Her 3-year-old campaign included a victory in the Fair Grounds Oaks (G2).